The fast-paced, hyper-theatrical exuberance of Baz Lurhman’s style is like filmic Marmite. His first film, Strictly Ballroom was the perfect vehicle for his vision, a small-budget project made large with over-the-top performances and a cartoon-like quality that was funny, fresh and endearing. Since then, as Lurhman’s budgets have increased, the exuberance has grown and grown, while the endearment factor has relatively diminished, dipping to absolute zero in his last outing – the execrable epic that was Australia. His version of The Great Gatsby crashes into our cinemas on a similar wave of hype to that which pre-empted Australia, but there’s no denying that Lurhman is the perfect director to take on a remake of F Scott Fitzgerald’s novel and maybe finally do it justice. After all, it’s a book that might have been the architectural blueprint for Lurhman’s house of cinematic cards. In one of the director’s regular nods to the 1939 version of The Wizard of Oz, as opening credits for this Gatsby unfold they morph from black and white to colour. There’s a sepia pallour to the opening scenes too, until the action shifts to Gatsby’s parties, and the colour explodes, over-the-rainbow style. There’s the quality of a colourised black and white photograph to the film, giving it an odd retro feeling that along with some disconcerting 3D effects, bring us into the hyper-jazz age action. Fatty Arbuckle or Clara Bow might pop out from behind one of the lush shrubs on Gatsby’s grounds, and you wouldn’t blink an eye. Lurhman plays around with 3D in a painterly way too. Words and numbers are etched on the screen and then dissemble and float towards you, snowflakes fall and dance right in front of your glasses. The Great Gatsby is a story about male consumption, whether it is of fast cars, big houses, booze, or most importantly, women. It’s about the haves and the have-nots, and at its heart is a man who once had nothing, but now has it all, and still wants more. Gatsby’s reaching for the stars, and at the zenith is Daisy Buchanan, the woman he desires above all things but can’t own, because she belongs to another man. Lurhman’s cartoonish style lends itself perfectly to the tale. It’s amped up so high that the tragedy of the have-nots, Myrtle and George Wilson – who represent the dull, eternal grindstone that is the underbelly of the American dream – gets lost in broad comedy and Grand Guignol performance from Isla Fisher and Jason Clarke, respectively. But that’s okay, because this Gatsby is not about the underbelly; it’s about the surface. It’s about possessions and possessiveness, and at its heart is a character putting on one hell of a show, like a swan that’s paddling crazily beneath the water. This film is exactly that – one hell of a show, paddling hard. And it’s a very enjoyable show too. The casting of Leonardo DiCaprio as Gatsby is Lurhman’s trump card. He’s an actor of such depth that he can bring heart and emotion to the most frivolous of scenes, and even though he has to say “old sport” about 3,000 times, he wipes the floor with everyone else on the set, bar maybe the sharp-eyed Joel Edgerton as the Gatsby’s nemesis, Tom Buchanan. Apart from her costumes, the usually brilliant Carey Mulligan is a disappointment. But then again, Daisy is little more than a cipher for all the selfish dreams the men in this story cradle. She has little to do but look stunningly beautiful, bored, wistful, or cry tears that look like diamonds running down her perfect cheeks. The edgy Elizabeth Debicki as Daisy’s friend, Jordan Baker completely outshines Mulligan. The one character that appears in every scene is, of course, the narrator, Nick Carraway, as played by Tobey Maguire. His performance annoyed the woman sitting next to me, but I found him to be pitch perfect, in that you completely forgot he was there, even when his face was peering out at you in 3D. Tom Buchanan says to Nick early in the film, “I know you like to watch, and that’s fine with me,” and that’s fine with us too. He’s the human filter through which this story of a crowd of vaudeville performers can somehow be grounded in reality. In the end, although it leaves us with a message about the meaning of life and all that jazz, you forget it instantly. The Great Gatsby is about spectacle. You exit the cinema remembering the costumes and the frenetic dancing more than any underlying serious theme. 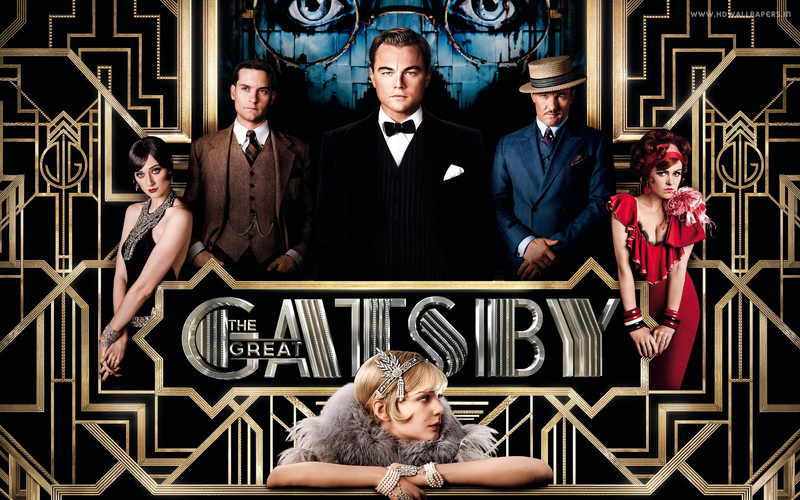 Fitzgerald might be turning in his grave – The Great Gatsby is supposed to be a Great American Novel after all – but as Lurhman proves, he deserves this kind of treatment.